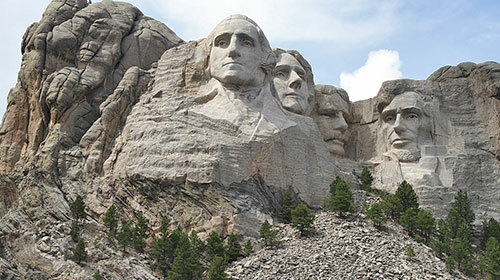 Majestic figures of George Washington, Thomas Jefferson, Theodore Roosevelt and Abraham Lincoln, surrounded by the beauty of the Black Hills of South Dakota, tell the story of the birth, growth, development and preservation of this country. From the history of the first inhabitants to the diversity of America today, Mount Rushmore brings visitors face to face with the rich heritage we all share. 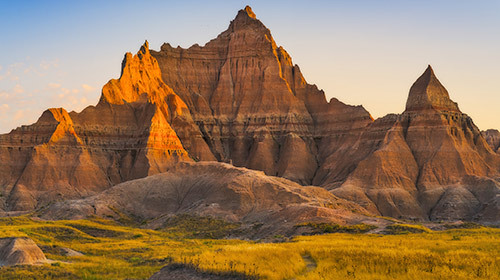 The rugged beauty of the Badlands draws visitors from around the world. 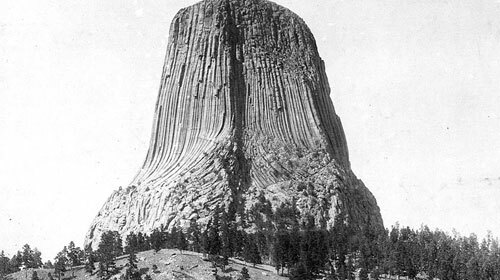 These striking geologic deposits contain one of the world’s richest fossil beds. Mammals such as the rhino, horse, and saber-toothed cat once roamed here. The park’s 244,000 acres protect an expanse of mixed-grass prairie where bison, bighorn sheep, prairie dogs, and black-footed ferrets live today. The granite peaks and rolling plains are calling. The clear mountain waters are inviting and the open ranges are waiting to be discovered. 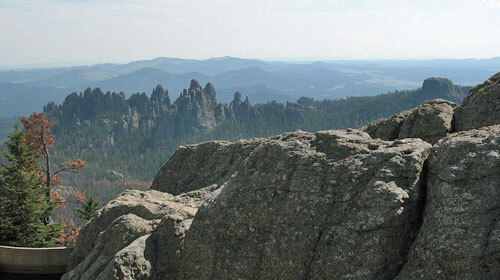 Bring your family to Custer State Park and let yourself run wild. Encompassing 71,000 acres in the Black Hills, Custer State Park is home to abundant wildlife and adventure; camping, hiking, biking, swimming, fishing, or relaxing, there’s something here for everyone. 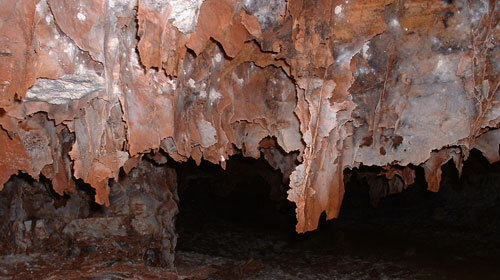 Immerse yourself within the third longest cave in the world. 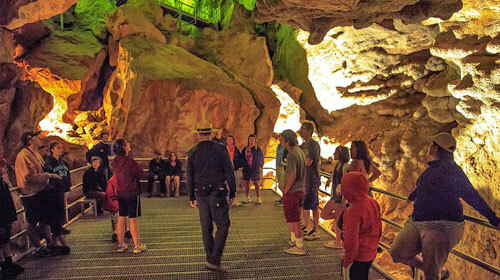 With over 194 miles of mapped and surveyed passages, this underground wilderness appeals to human curiosity. Its splendor is revealed through fragile formations and glimpses of brilliant color. Its maze of passages lure explorers, and its scientific wealth remains a mystery. This resource is truly a jewel in the National Park Service. 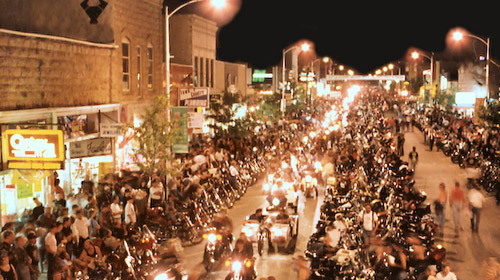 The Black Hills, in western South Dakota and northeastern Wyoming, consists of 1.2 million acres of forested hills and mountains, approximately 110 miles long and 70 miles wide. Enjoy yourself while viewing the many rugged rock formations, canyons and gulches, open grassland parks, tumbling streams, and deep blue lakes. 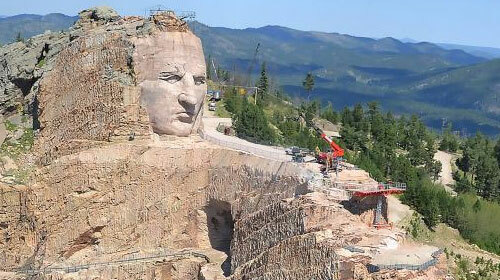 Millions of visitors come to the Black Hills each year to experience the rich and diverse heritage. During the Cold War, a vast arsenal of nuclear missiles were placed in the Great Plains. Hidden in plain sight, for thirty years 1,000 missiles were kept on constant alert; hundreds remain today. 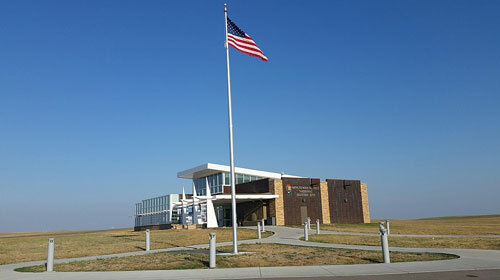 The Minuteman Missile remains an iconic weapon in the American nuclear arsenal. It holds the power to destroy civilization, but is meant as a nuclear deterrent to maintain peace and prevent war. Custer State Park in the beautiful Black Hills of western South Dakota is full of lush forests, quiet and serene meadows, and majestic mountains. 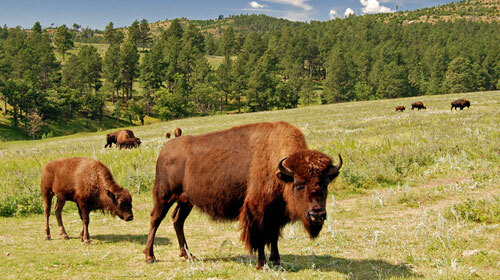 This 71,000-acre state park is also home to one of the world's largest publicly-owned bison herds, nearly 1,300 strong. 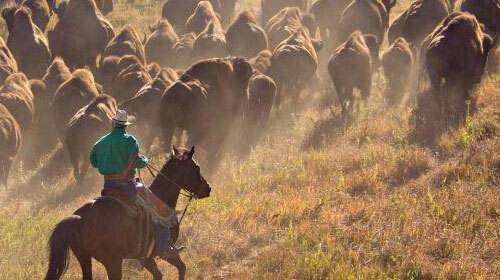 Each fall, the ground rumbles and the dust flies as cowboys, cowgirls and park crews saddle up to bring in the thundering herd.